A Work in Progress: There's always another book(s) around the corner. There's always another book(s) around the corner. I was very disappointed when I went to the library last night. Since I work in a library, and I work in the ordering and receiving department, I am pretty good at figuring out the status notations in library catalogs. Now, not that I'm paying close attention, but I've noticed that there are at least five or six books that I am in line for that seem to be cataloged and ready to go, but haven't yet been 'released' to the public. I assume they need to be physically processed. No doubt they have hundreds of titles like this, and they'll get to mine eventually. I am sure, though, when they do they will all be sent to the hold shelf at once. But none were there last night (just one music CD, which I was happy to get, but it's not a book...). My disappointment was assuaged, however, when I arrived home to several packages that looked distinctly like they contained books. Yes, I was right. Books. And some were even unexpected surprises. Actually the three Viragos that you see I knew about, but somehow managed to forget I was getting. A very kind reader (thanks Pam!) was recently at a book sale and found some Viragos they she already owned, so she passed them along to me. How serendipitous, since I am starting a little Virago binge. I can now add to my collection Mary Lavelle by Kate O'Brien, Year Before Last by Kay Boyle and A View of the Harbour by Elizabeth Taylor. 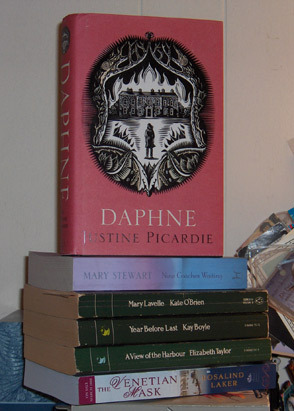 From the Book Depository I received Mary Stewart's Nine Coaches Waiting and Justine Picardi's Daphne. Although I'd like to jump right into Daphne, I will wait until I've whittled down my book pile just a little (really. ), as I think I might also have to reread Rebecca and look for a copy of The Infernal World of Branwell Bronte. The Picardi novel is a fictionalized account of Daphne Du Maurier's research and writing of her biography of Branwell Bronte. There is also a contemporary storyline about a researcher looking into Daphne's life and work. After reading Margaret Forster's biography of Daphne Du Maurier, this should be a interesting novel to read as a follow up. And I'm still planning on continuing to read her novels. I may even be inspired to pick up some of the Bronte's work as well. The last book, Rosalind Laker's The Venetian Mask, is a throwback to my high school days. It was one of last month's choices for Library Thing's Early Reviewer Program. It was a bit of a lark that I decided to throw my name into the lottery for it. I actually asked for two others, but this is the one I ended up with. I loved her books when I was much younger. They're essentially fluffy historical romances and I'm wondering what I'll make of her work now. Apparently her work went out of print and it's now being reissued. I am several books behind in reading the review copies I've gotten via Library Thing, so I'll be taking a break from it and trying to get caught up. I've been very fortunate to usually get a book each time they offer them, which amazes me as hundreds of people are requesting them. Besides I have plenty to keep me busy. If only I could remember that.